Get Your Big Red Bow! One lucky winner will be chosen at random on or around May 2, 2019 to receive a trip to Nashville for two to witness and/or be featured in the #BeTheGift campaign video. NO PURCHASE NECESSARY. A PURCHASE OR PAYMENT OF ANY KIND WILL NOT IMPROVE YOUR CHANCE OF WINNING. Eligibility: The #BeTheGift Donate Life Month Contest (the “Contest”) is open only to legal residents of the fifty (50) United States (including the District of Columbia), who are at least eighteen (18) years old at the time of entry. Employees of DCI Donor Services, DVL Seigenthaler and their parent and affiliate companies, as well as the immediate family (spouse, parents, siblings and children) and household members of each such employee, are not eligible. The Contest is subject to all applicable federal, state, provincial, municipal, territorial and local laws and regulations and is void where prohibited by law. Participation constitutes entrant’s full and unconditional agreement to these Official Rules and Sponsor’s and Administrator’s decisions, which are final and binding in all matters related to the Contest. Winning the prize is contingent upon fulfilling all requirements set forth herein. Timing: The Contest begins on April 12, 2019 and ends on April 30, 2019. Administrator’s computer is the official time-keeping device for the Contest. Register as an organ and/or tissue donor. Take a photo with the Blue and Green Bow. Comment, Post or Tweet the photo on Facebook, Instagram or Twitter with the hashtag #BeTheGift during the contest period. For Facebook, you must respond to the selected post on TN Donor Services’ page. For Twitter or Instagram, must have your setting set to ‘public’ to ensure your post is visible to DCI Donor Services. Contest entries must be tweeted/posted between April 12, 2019 10:00 a.m. ET and April 30, 2018 11:59 p.m. ET. Your tweet or post must contain the hashtag #BeTheGift in order to qualify as an entry. By entering, you agree that your tweet/post conforms to the Content Restrictions as defined below and that Sponsor, in its sole discretion, may disqualify you from the Contest if it believes that your Twitpic/Instagram post fails to conform to the Content Restrictions. Your use of the Hashtag constitutes your unconditional consent to and acceptance of these Official Rules. The Twitpic or Instagram post must visibly show the Blue and Green Bow. The post/tweet must not contain material that is unlawful, in violation of or contrary to the laws or regulations in any state where Twitpic is created. Entrant must have permission from all individuals who appear in the post/tweet to use their name and likeness in the post/tweet and to grant the rights set forth herein. If requested, entrant must be able to provide such permissions in a form acceptable to Sponsor. Uploading a post/tweet constitutes entrant’s consent to give Sponsor a royalty-free, irrevocable, perpetual, non-exclusive license to use, reproduce, modify, publish, create derivative works from, and display such submissions in whole or in part, on a worldwide basis, and to incorporate it into other works, in any form, media or technology now known or later developed, including for promotional or marketing purposes. If requested, entrant will sign any documentation that may be required for Sponsor or its designees to make use of the non-exclusive rights entrant is granting to use the post/tweet. Limit: Contest participants may submit as many entries as they would like during the contest period. Use of any automated system to participate is prohibited and will result in disqualification. In the event of a dispute as to any registration, the authorized account holder of the email address used to register will be deemed to be the entrant. The “authorized account holder” is the natural person assigned an email address by an Internet access provider, online service provider or other organization responsible for assigning email addresses for the domain associated with the submitted address. The potential winner may be required to show proof of being the authorized account holder. Grand Prize: Winner of the Grand Prize will be chosen at random. Sponsor will select potential Contest winner from an evaluation of all eligible entries received during the Promotion Period, on or around May 2, 2019. The selected Grand Prize winner will receive a Facebook, Twitter or Instagram message after the date of the drawing from DCI Donor Services to the Account used to enter the Contest. In order to receive the Message, the potential winner’s “Tweet Privacy” Account setting must be “unchecked” and/or Instagram setting must be set to “public”. The potential winner will be required to respond to the Message within seven (7) days of the date the Message was posted, with the information requested, or prize will be forfeited. Once this information is collected, the potential winner will receive an email notification from Sponsor/Administrator. Receiving a prize is contingent upon compliance with these Official Rules. 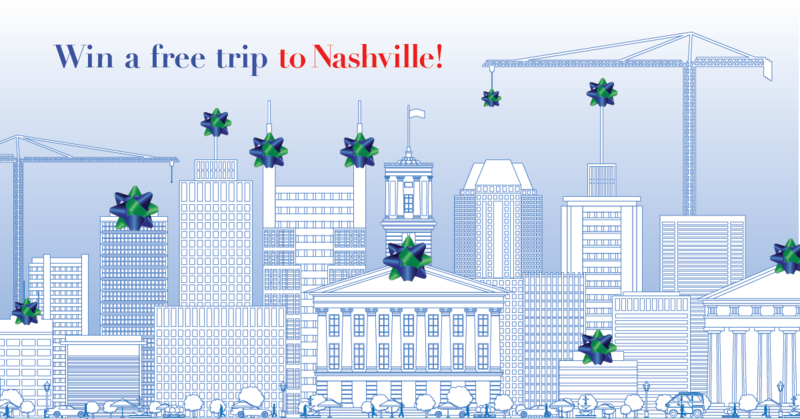 ONE (1) GRAND PRIZE: Roundtrip (economy) tickets for two (2) valid for air transportation for the Grand Prize winner and one (1) guest from anywhere in the contiguous United States to Nashville and two (2) nights hotel courtesy of DCI Donor Services. Grand Prize winner will be invited to participate in #BeTheGift’s new campaign video. Dates of travel are TBD and are contingent upon dates of video shoot. Prize is non-transferable and no substitution will be made except as provided herein at the Sponsor’s sole discretion. For clarification and the removal of doubt, the Grand Prize does not include ground transportation and any other incidental expenses incurred at the destination.